A little while ago, Alexis tried SVD sniper rifle, found the recoil excessive. The slanted stock shape contributed to the problem. 6.5 Grendel, a mild cartridge with high ballistic coefficient bullets, may be the reasonable solution for her long-range use. This is one of Fighting Sheepdog custom rifles, not hers to keep. For the sake of her family’s ammo budget, she’s staying with 22LR and 5.56mm for now. 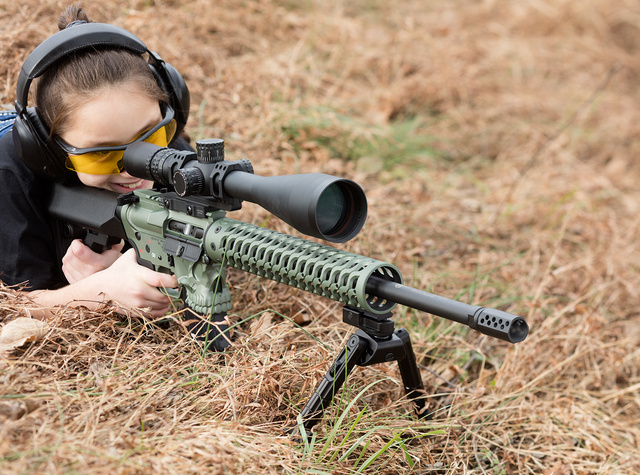 This entry was posted in rifle, training, weapon and tagged 6.5Grendel, AR15, child, girl, optics, scope. Bookmark the permalink. Great job Alexis! Just being brave enough to jump on it is impressive. Braver than me! !